Follow the main Boxing Day live text. Stoke XI: Butland; Johnson, Wollscheid, Sahwcross, Pieters; Cameron, Whelan; Afellay, Arnautovic, Shaqiri; Bojan. Right, that is all from me. A Christmas cracker of a start to the Boxing Day football with a big upset. Can Louis van Gaal survive this one? The rest of the day's action is well under way, so head on over to our main live coverage pagehere. From there, you can also pick individual live text commentaries to follow. Cheerio. Finally, a bit more from Louis van Gaal, this time speaking to BBC Sport: "We have lost the game in the first 45 minutes because we didn't dare to play our football. That is what I have analysed. "It is very difficult as I'm also part of four losses and I have to cope with that. More important is that my players have to perform. "I thought it was the right decision [to leave out Wayne Rooney] otherwise I would not have done it. "I don't think that is interesting what they [the headlines] do to me. I have said they have to stick by the facts. The scrutiny is alright for me, I'm used to that. You have to stick by the facts and not rubbish. "I have received it [backing of club] all the time but we have lost today so there is a new situation. I feel the support of my players and my board. The fans will be disappointed but that is logical after four defeats." Mr Kev: How come at Chelsea it wasn't Joses fault but the players, yet at United it's all LVGs fault ? Get involved on Twitter at #bbcfootball or by texting us at 81111. Louis van Gaal, speaking to Sky Sports: "They score out of a free-kick, then at half time we spoke with each other and the second half was much better but still we have created one or two chances, you have to score though. "The problem is we don't dare to play, that is my analysis. "It is more difficult because I am also part of the four matches that we have lost so people are looking at me. I have to deal with that but more importantly the players have to deal with that becayuse they have to perform. Asked about whether the people were still behind him, Van Gaal added: "It is another situation. We have lost the fourth game, we have to wait and see." Louis van Gaal has just been dissecting that game and he sounds like a beaten man. Stoke City boss Mark Hughes: "As the game progressed we gained more confidence by the manner of the performance. "Jack Butland made an outstanding save at a key time. Apart from that he didn't have a great deal to do." The last time Manchester United lost four competitive games in a row in a single season was in 1961, when a young Elvis Pressley was number one in the charts with his new hit - Are You Lonesome Tonight. "I can't see Louis van Gaal staying beyond this now. On Tuesday he walked out of his press conference, and there has been an awful lot of pressure on him this week. "That performance was as bad you will ever see from a Manchester United side." "Manchester United are like 10 headless chickens running around at the moment," he says. 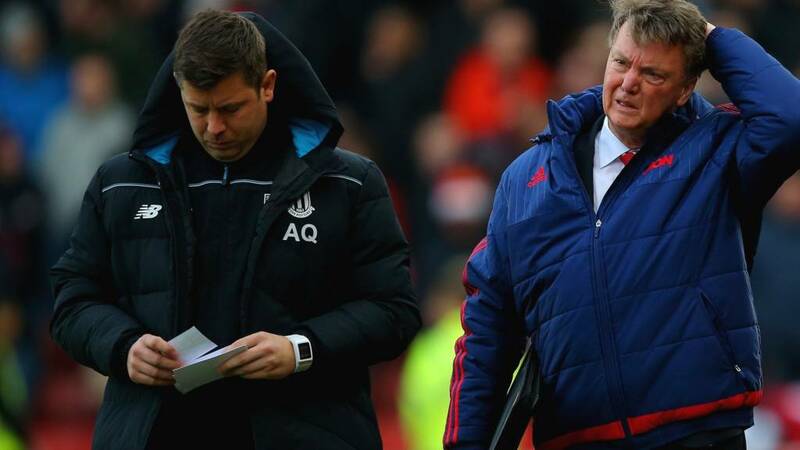 "Van Gaal will go - he'll have to because the quality of the football is poor. You can't enjoy it. They don't look like they know what they're doing. He can't stay." Maddy Raman: LVG has the look of a man who knows his managerial career has just come to an end. Laurie Ainsworth: Man Utd will be no better with a new manager. The players are mostly second-rate and the team is mid-table at best. Marc Broderick: Slow, boring, lifeless, Bring in the Class of '92 and get rid of Van Gaal please!!! Soul-destroying football. "I would have liked to have seen more of Anthony Martial for Manchester United. Stoke have been strong though and they get the points. "The first half did it, a good goal from Bojan and a cracker from Marko Arnautovic. In the first period, they looked lost, they looked short of inspiration. "They were better in the second half with Wayne Rooney on the pitch but they didn't have the firepower you would expect of them." All over as Stoke ultimately ease to a comfortable win over Manchester United, who were as poor as they have ever been this season. Louis van Gaal heads towards the tunnel, holds up a hand to acknowledge the Manchester United fans. I didn't hear any boos, but this is surely a result that will only stoke the fire of discontent further? Three minutes of added time go up on the board as Manchester United push forward again. They get through the Stoke defence, with Juan Mata put clear, but his shot aimed for the top corner is pushed behind by Jack Butland. Louis van Gaal remains in his seat as Stoke fans taunt Manchester United fans by singing Jose Mourinho's name. Tough times indeed. Two minutes of normal time left and Manchester United have the ball. Some good persistence by Wayne Rooney as he battles on the right to make room for a cross, but no Manchester United player attacks the ball and Stoke have all the time to clear. C Li: Just caught the Utd scoreline. Can't see LVG surviving till next year. Question is Mour negative style or Pep talk? Patrick Galvin: All this talk of Jose to MUFC...they should really look at Mark Hughes. Brilliant at Blackburn and look at Stoke now? Matt Harding: Never wanted Mourinho at Utd, but I'd take anybody else right now. End to end now as Jack Butland pushes behind Anthony Martial's curled effort. Moments later, it two against one as Stoke break but Bojan's low drive is easy picking for David de Gea. Time is ticking away and Louis van Gaal makes a change as Andreas Pereira comes on for Ander Herrera, not the most intimidating one as far as Stoke are concerned. Pereira, Cameron Borthwick-Jackson, Morgan Schneiderlin, Sergio Romero, Guillermo Varela and Patrick McNair. Not exactly a bench full of fearsome attacking options. Paul Calf: Glass of prosecco not strong enough to get through United's second half?! Who says football has lost its working class roots... (see 63 mins). SJ Ismvil: Can we all agree the golden days for Manchester United are over? Nick Clohessy: You know who would really help LvG today? That Chicarito bloke. Or perhaps that Januzaj. Maybe even Kagawa or Zaha? "Bojan Krkic. What a cracking little player." Bojan's trickery gets him into the area on the right and he crosses low, forcing David De Gea to punch away at his near post. There used to be a time when, even with 15 minutes left, you would not bet against Manchester United coming back to win. With this team, though, you just can't see it. Stoke boss Mark Hughes is mulling over whether to stick or twist. He decides to take the latter option, making his third and final change as Charlie Adam comes on for Glenn Whelan. "Manchester United had a free-kick there [before the Stoke chance] and there was no width. If you put players wide, it stretches the defence and players have to move out to cover them. You can't have no width at this level." Manchester United have been better this half but their shaky defence will continue to give Louis van Gaal nightmares. This time, Bojan delivers a fine cross behind the defence aimed at Marko Arnautovic, Ashley Young sticks out a boot to cut it out but almost puts the ball beyond his own keeper. David de Gea's reactions are bang up to scratch though as he claws the ball out of the air. Young had to make the intervention, but that could have been so, so costly. Get involved on Twitter at #bbcfootball or text us at 81111. Ibrahim Afellay skips along the edge of the area, evading a number of half-hearted challenges before feeding the ball to Marko Arnautovic inside the area. He takes one touch too many, though, allowing the Manchester United defence to recover and snuff out the chance. Stoke's change to a more defensive style is not suiting Xherdan Shaqiri. He has barely had a sniff of the ball in this half and is substituted, with Mame Biram Diouf replacing him. The Manchester United fans burst into noise as the visitors fashion their best chance of the game. Wayne Rooney makes it with a fine ball across the box to Marouane Fellaini who, from eight yards, sees his low strike held by Jack Butland. I can't help but feel Fellaini should have smashed that into the roof of the net, but a potentially crucial save. Stoke are very much playing the soak it up and punch on the counter tactic at the moment, a tactic that almost pays dividends as Marko Arnautovic chases a long ball forward. Just one defender to beat, but he trips over the ball and Manchester United survive. Ashley Young, who has had a tough old time dealing with Marko Arnautivic at right back, gets to enjoy a rare foray forward as he slips the ball past his marker on the right and then fizzes a teasing cross in behind the defence. Wayne Rooney is flagged offside, though. "I don't think Manchester United will make a move for another manager before Monday. Chelsea should not have sacked Jose Mourinho, I could not see the point in doing it. Let a manager have a full season and let him fail. Something must have gone on with Mourinho. They are still in Europe and the let him go?" Wayne Rooney is playing centrally, with Anthony Martial and Maroaune Fellaini either side. Rooney is certainly looking like he wants to make up for lost time, with lots of buzzing about, but he is not doing much to worry the Stoke defence, which is sitting deep in this half. Andrew: Man Utd's golden era is truly over and partly because Ferguson left a basket case. Sacking LvG will not change anything except pushing them to further instability. Put an inexperianced manager like Giggs in charge and this could hasten worse to come like the golden drop of 1973. Job done. "I just didn't see Juan Mata in the first half..."
From the average positions of the teams below, it looks like Stoke will be sitting back and defending their lead and put the onus on Manchester United to break them down. Stoke get forward and Bojan, ball at the feet, takes a tumble in the area. The referee blows his whistle. Penalty? No, free-kick to Manchester United and Bojan is booked for simulation. Correct decision, but that would have been a heart-in-mouth moment for Louis van Gaal. It is almost two years since Wayne Rooney last came on as a substitute for Manchester United. It's almost seven years since he came on and scored. The England international is straight into the action as he stands over a United free-kick, floating the ball to Marouane Fellaini but the midfielder commits a foul in the area and Stoke get a free-kick. The whistle goes and we are back under way. Could this be the last 45 minutes of Louis van Gaal's Manchester United career? Or will he live to fight another day? Wayne Rooney is indeed coming on. Louis van Gaal feeds him some instructions before slapping him on the back. Memphis Depay is the man to make way. Stoke also make a change as Marco Van Ginkel replaces Glenn Whelan. Wayne Rooney is out warming up and in discussions with one of the Manchester United coaches. Coming on? Will it even make a difference? United finished that half with three shots on target, but none of them really tested Jack Butland. Stuart Tunstal: Big difference is Stoke attackers have had to fight their way to the top. Depay, Martial and other big money players with big egos have been spoon fed. An arrogant manager as well to match. Alex, Somerset: Another Louis van howler. Forget signing a striker in January and sign Guardiola NOW! "The Manchester United team has to improve somehow in the second half. Louis van Gaal needs some strength in the team. Morgan Schneiderlin has that. Wayne Rooney is named on the bench so he must be fit. "The one thing they wanted here today was solidity at the back and no errors. It happened though,. The first goal was a walk in and United were scattered, they have not recovered from that, the second goal was well struck but nobody was closing him down. "Louis van Gaal has to do something about the midfield area. There are good players in this team, but we have not seen them." Manchester United's misfortune is summed up as Daley Blind slips as he crosses and the ball bobbles out for a goal kick. That rather embarrassing moment happens to be the last action of the half. It has been a comedy of errors from United so far. Remember when they were a team to be feared? Juan Mata curls a ball into the box but it is just over the head of Ander Herrera. How Mata will have wished that was Marouane Fellaini making the run, the cross was probably the perfect height for the big man. Gary Robert, mid-Wales: Only change at half-time should be a taxi for LvG. Get stripped Jose, you're on. Three minutes of added time as the camera focuses on Louis van Gaal. There's no urgency from the Manchester United boss as he remains sat in his seat, binder in hand and one of his coaches instead standing up to urge the players forward. Shaun, Somerset: Crickey! I see LvG has saved his portion of Turkey for today with former Red Devil Mark Hughes happy to offer him as much 'stuffing' as possible... Time for Giggs. Jeffery Nabong: Van Gaal is living on past reputation. His authoritarian style of management is slowly and surely killing this team. Manchester United, though, are pressing a bit more now as half-time approaches. If they can grab one before the break, then who knows what could happen in the second half. Glenn Whelan heads a corner into the sidenetting, but the hosts get a free-kick as Marouane Fellaini is spotted grappling his marker. OK, Wayne Rooney's form has been poor but the service a Manchester United forward receives is often poor this season. Anthony Martial, playing as a lone striker, has touched the ball just twice inside the area, and is often having to drop deep to get the ball. His frustration at getting little inside the box is highlighted when he smashes the ball well over from outside the area. Better from Manchester United as Anthony Martial wins a corner. Daley Blind takes it, aiming for the head of Marouane Fellaini, but it is knocked behind again by a Stoke player. Glenn Whelan then sweeps up the second corner. Big moment as Marko Arnautovic spurns the chance to seal the three points. Both Ashley Young and Phil Jones fail to pick up his run as he breaks the offside trap to latch onto Bojan's ball. He is one-on-one, looks certain to score, but shoots wide. What can Louis van Gaal do to rescue this? If I was him, I'd be having a serious look at Ashley Young at right back. He is getting torn apart by Marko Arnautovic and Bojan. Time to throw caution to the wind? Nothing much to report from matters on the pitch. Stoke, at the moment, are fully in control. Jean-Paul Brayer: If Man United get to the 40-point mark they will be safe - just let us have a bit of confidence in Van Gaal! A chance for Manchester United to respond as they win a free-kick, some 30 yards from goal. Memphis whacks it through a crowd of players and Jack Butland pushes the ball into the path of Marouane Fellaini. He sidefoots tamely back at the Stoke keeper to mocking cheers from the home crowd. It wouldn't have counted if Fellaini had scored anyway, with the offside flag up. "What a shot that was, an absolute belter. The goalkeeper had no chance and the Manchester Untied fans behind that goal are trying to rally their team. Boy, do they need rallying. "Defensively, United do no look secure at all. You have to close it down. Where are the big boys? Time to stand up and be counted." Gareth Soye: Will Louis van Gaal make it to the end of this match? My word! Stunning goal and Stoke are running riot as Manchester United's day gets a whole lot worse. This time, a Bojan free-kick strikes the United wall but Marko Arnautovic pounces to launch an unstoppable drive into the back of the net from 25 yards. What must Louis van Gaal be thinking!? Memphis is desperate to make amends. Too desperate. He tries to take on Geoff Cameron but just runs straight into the Stoke defender and the hosts break almost fashioning a chance for a second goal before the offside flag allows Louis van Gaal to breathe a tad easier. Callum Anderson: Low confidence makes you do stupid, stupid things...as Memphis demonstrated there. Why didn't he just hook it out?! Anywhere! Sam Scrivens: Man Utd are so bad they make Stoke look good......Stoke ARE good. Bojan, Shaqiri, 1-0, Van Gaal fired. "I am looking at Louis van Gaal, he can't do anything about that. I don't know what he is trying to do there, diving to head the ball back to the goalkeeper, it got nowhere. "What a gift that is and more pressure on the manager." Oh dear! The absolute last thing Louis van Gaal will want to see as some shocking defending by Memphis gifts Stoke the lead. The Manchester United man tries to head back to David de Gea but it is far too weak and Glen Johnson nips in, crosses to Bojan, who sidefoots home. The pressure has just been cranked up several notches. "Boring, boring, boring" chant the Stoke fans as Manchester United embark on a rare attack. Those chants quieten down as the visitors win a free-kick on the left. Memphis shapes up to cross but instead whips the ball towards the near post, almost catching Jack Butland out, but the keeper dives and clutches the ball. Lovely stuff from Xherdan Shaqiri, who dumbfounds Daley Blind with some tricky feet not once, but three times. Ander Herrera steams in and goes in too hard on the Stoke man. Free-kick. Shaqiri sends the ball towards the far post and Manchester United clear, unconvincingly. "Stoke have Xherdan Shaqiri, Marko Arnautovic and Ibrahim Afellay sticking up the top of the pitch, but Bojan is filtering around them. That is quite a positive attitude from them." Stoke are the team with the majority of the ball at the moment. A free-kick for Stoke, some 30 yards from goal. Marko Arnautovic fancies it and bends the ball over the wall and towards the top corner. Wide. David de Gea clearly never felt threatened as he opted not to move for it, but it didn't look too far off from the replay. Stoke have started well, but it is Manchester United who have the first shot on target, Ander Herrera driving a low shot at Jack Butland. That chance came after a dodgy backpass to Butland, the ball coming at pace and forcing the Stoke keeper to hastily clear under pressure from Anthony Martial. You know what, I really look forward to seeing Stoke play these days and their front four is an exciting one. Marko Arnautovic, Ibrahim Afellay and Xherdan Shaqiri are playing behind Bojan and at the moment they are keeping the Manchester United defence busy. "The thing about Louis van Gaal is that he likes the two full-backs to work as attackers. He is also banking on Marouane Fellaini, who has played in a number of positions for the side. He is almost like the utility man. Today, he is playing in central midfield." Glenn Whelan over hits a ball into the box after the corner, before Bojan launches an effort high over. Stoke are up for this one. It looks like Marouane Fellaini is playing as the most advanced midfielder, roving behind Anthony Martial, with Michael Carrick and Ander Herrera deep. They'v not seen much of the ball yet, though, as Stoke crack straight on with pressing the United defence. Marko Arnautovic bursts forward before playing a fine pass to Xherdan Shaqiri, his cross runs across the goal but Stoke pick up the ball and win a corner. A big 90 minutes for Louis van Gaal is under way. It is 'man versus machine' this week. Our man Mark Lawrenson takes on a state-of-the-art super-computer called SAM (Sports Analytics Machine) in his weekly prediction game - find out here what they have plumped for in all of the Boxing Day fixtures in the Premier League. Think Manchester United are under-performing in the Premier League? Well, they're faring better than their fans in our Prediction League. United supporters are struggling down in 15th place, while Stoke fans are flying high in fifth. You can help your team climb the table by having your say in our Predictor game. "When Louis van Gaal came to Manchester United, he came with a real reputation. You look at the clubs he has managed - Ajax, Barcelona, Bayern Munich - but it is all about results. "Going out of the Champions League was the big one, there wouldn't have been the same pressure on him. Consequently, he has to come up with some formula to change results. This is a big one for him." The players are in the tunnel, so a final reminder of the team news before kick-off. If you've just popped onto this page, the big news is that Wayne Rooney is on the bench. Manchester United boss Louis van Gaal, speaking to Sky Sports: "It was better to play Ander Herrera instead of Wayne Rooney. It is a tactical decision. "I don't think it is to take drastic measures, it is to do with my gameplan. "I think we have done everything we can do. I have seen a good spirit and I fully believe in this game. "It is a main factor (wind) but you have to cope with that." "The message Manchester United were giving before Christmas was that Pep Guardiola was going to Manchester City. This was before going out of the Champions League and back-to-back Premier League defeats. They said Louis van Gaal was a genius manager. It does not look like a team that will challenge for the league. Manchester United have had numerous chances to nip these rumours in the bud. They could have said they support Van Gaal and relaxed about Guardiola and Jose Mourinho, but they pulled the shutters down." Jack: It's about time Rooney was dropped, Schweinsteiger should be the captain for obvious reasons, that's where Van Gaal made a mistake. Now with a more mobile, pacy front line hopefully United play with a bit more freedom and show us what they can do. Gerry: Well this will be a wake-up call for Rooney. He's a kind of fighter and will improve after this drop. LVG should've done it before. Stephen Kennedy: Big call from LVG to drop Rooney but also a big call not to play Schneiderlin. Stoke will fancy their chances. I mentioned earlier about the art of pulling a fake happy faces at Christmas when getting socks or other such practical but boring presents (sorry mum!). Well, Louis van Gaal was doing one of those when he strode into the stadium earlier, clutching his binder. He has said that his decision to name Wayne Rooney on the bench is a tactical one, insisting it wasn't a 'drastic measure' to not include the forward in the first XI. Time will tell. I'll drop the poem into the next entry. "If the newspaper reports are accurate then Manchester United's match at Stoke could be Louis van Gaal's last as their manager. "There appear to be three scenarios if he departs; Jose Mourinho takes over, Ryan Giggs succeeds Van Gaal or an interim manager is appointed, possibly Giggs, with Pep Guardiola taking the helm in the summer. "Few scribes offer encouragement for the Dutchman. It's not simply about United's recent poor results but the manner of them. Even Stoke boss Mark Hughes recently referred to a "United way" that demands entertainment at its core. "It's no coincidence that Hughes has transformed Stoke's methods, typified by the stylish way they saw off Manchester City earlier this month. "While Hughes will be keen for his side to replicate that performance, Van Gaal won't want to lie down either, which all points to a fascinating start to the Boxing Day programme." Any kids who got a telescope from a certain department store for Christmas might be a bit disappointed that when they point the thing at the moon, there won't be some teary old fella staring back. Instead, it could well be a Stoke City flag. A Potters' fan's campaign to get Stoke in space has come to fruition, with British astronaut Tim Peake having a flag sent up to the International Space Station. He's now unfurled it and stuck it one of the ISS' windows. You can see it through a telescope too, apparently. You can tweet on #bbcfootball,text on 81111 (UK onlyand please include a name),or post on the MOTD Facebook page. As always this is your platform to air your views, so get involved. Thoughts on Wayne Rooney on the bench? A good or bad call by LVG in such a high-pressure game? Do you have faith in Van Gaal to turn things around? Or is his time up? Get involved via#bbcfootball,text in on81111(UK only) or have your say on theMatch of the DayFacebook page. The weather is miserable outside, no doubt about it. So miserable, in fact, that several fixtures have been postponed because of heavy rain. You can check which games are off so farhere. Louis van Gaal has been out to check the Britannia Stadium pitch and I wouldn't have put it past him to have done a bit of rain dancing while he was out there too. He would probably have fancied this game to have been called off so he could enjoy Christmas a bit more than he probably has. There's no rain in Stoke, though, just a strong, strong wind, which has blown a side parting into Marouane Fellaini's afro as he goes through his pre-match warm up. "Lots have wanted Rooney left out yet LVG has increased pressure on himself by doing it. Brave call." Defender Geoff Cameron returns to Stoke's side in place of Marco van Ginkel - the only change from the side that lost 2-1 at home to Crystal Palace on 19 December. As I've just mentioned, there is no place for Wayne Rooney in Manchester United's starting line-up as Spanish midfielder Ander Herrera returns the side following the 2-1 home defeat to Norwich City on 19 December. Speaking of Wayne Rooney, he spoke up for Louis van Gaal earlier this week, saying the players had to fight to save his job. His reward for that show of support for Van Gaal? A place on the bench. Three hundred and sixty five days ago Louis van Gaal was certainly full of Christmas cheer. He was the toast of Old Trafford after overseeing a run of six wins and one draw in the run up to Christmas, and took on the role of Santa on Boxing Day, dishing out gifts before his side beat Newcastle 3-1. Even Wayne Rooney bagged a couple that day. United go into today's game at Stoke without a win in their last six games and Van Gaal under huge pressure,with some reports suggestinghe could get the boot if they fail to take all three points today. Enjoy your wine and a mince pie? Had a good Christmas? Get the gifts you wanted? Did you put on your best happy face when unwrapping yet another pair of socks? The build-up to Christmas seems to go on forever these days and when the day itself comes, it is over in a flash. That was probably wasn't the case for Louis van Gaal. however. I could see the Dutchman sitting at the table, staring off into the middle distance. Christmas dinner uneaten, mince pies and red wine left untouched. Van Gaal's mind, after a tetchy news conference earlier this week, will unlikely have been on any of the Christmas Day festivities.